Entries were received from as far away as California in 2014 while the local Indiana Competition is still intense. 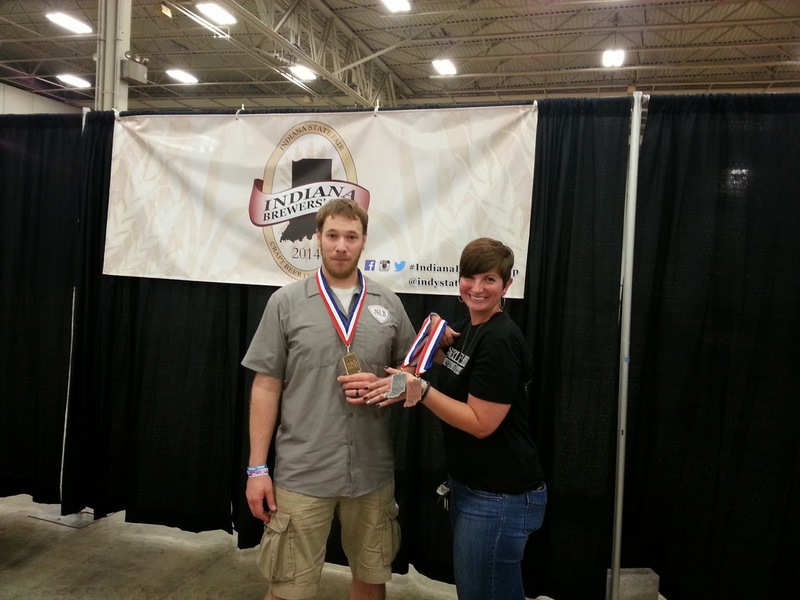 News This Year: Breweries open a relatively short time took home medals. The landscape is changing as Indiana nears 100 breweries and brewers from out of state continue to enter this competition. Two newer breweries in Evansville, IN, walked out with a host of awards! Tin Man Brewing opened in late 2012 and has been fine tuning their operation and their beers. They took a total of 4 medals winning gold for their stout and a spiced beer. Carson’s Brewing was on a pilot batch back in Spring 2013 and has had their full commercial brewery opened for less than a year. Former Home Brewer John Mills made the switch to Pro Brewer for Carson’s and left with 3 medals! Perhaps the quickest brewery to win an award is Scarlet Lane, distributing only since May, with their tasting room to open July 20 in McCordsville. The power of female owner Lane who learned beer in Oregon and Head Brewer Chris Knott, formerly of the RAM came through with 3 awards. Following is our unofficial list of Gold Medal First Place Winners (as noted from announcements at the Saturday reception). Forgive Spelling and attribution of cities based on our notes. Shown are pro-brewers Elyse Lane (owner) and Chris Knot (Head Brewer) from one of Indiana’s newest Breweries, who are planning to just open their tasting room on July 20. They received 3 medals including gold. They’ve only distributed since May 2014. 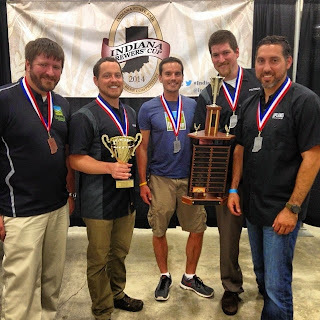 HomeBrew Club Foam Blowers of Indiana made a strong showing again with multiple medals taking both major Club awards! 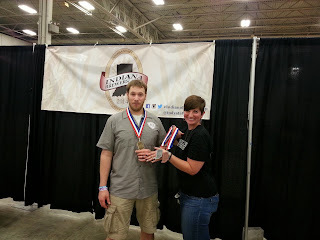 Interestingly the Home Brew Best-Of-Show and Home Brewer of the Year went to Louisville based brewer, Evan Brill. BOTTOM PIC: Foam Blowers members sitting waiting for the news! 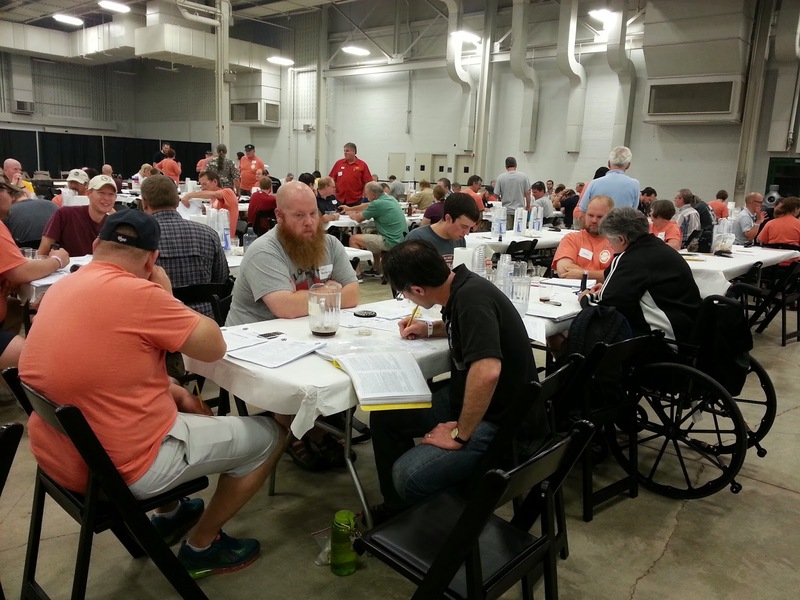 Thanks to Nathan Compton and Bob Ostrander for contributing to this blog. Bill Friday was a home brewer from West Lafayette, IN, who traveled not only Indiana but to beer events far and wide spreading the connections between people and beer. This writer recalls Bill best for his many buttons he made and sold to make money for the local THC club. Yet, most memorable for me was a visit to Lakefront Brewery in Milwaukee right after Bill passed on. Owner and Brewer Russ Klisch asked if I had known Bill. We almost spent more time talking about how much Bill had done for brewing than about Lakefront’s beer! Bill had been to Lakefront a few times and since Bill and Russ were both tall guys Bill jokingly started the Tall Brewers Society with Russ as Charter Member. Bill would be too humble to have an award named after him which is likely why it is so fitting. Remember the rest of the week! Tuesday July 15 is Indiana Girl’s Pint Out’s gathering at Mass Ave Pub, 745 Mass Ave, Indy, 6-9 PM with the unveiling of the top three beer cocktails recipes from the GPO contest with samples and available to purchase the drink! The Winning beer-tail will be featured at Mass Ave Pub for the rest of July! Saturday July 19 is the largest beer festival held in Indiana as nearly 6000 converge on Broad Ripple’s Optimist Park for the 19th Annual Indiana Microbrewers Festival with over 350 craft beers from 80+ brewers, mostly Indiana. Tickets are likely still available at Big Red Liquors and online HERE. The main event is 3-7PM and sold out last year. A portion of ticket sales benefit the Leukemia and Lymphoma Society. Next → Next post: MicroBrewers Festival – Strategies to make the most of a beer event!